The mass incident of reindeer death shouldn’t really be news. Lightning strikes are not that unusual a cause of animal death. Unfortunately, climate change will make it worse. Where is a reindeer supposed to go when it rains? Photo illustration by Slate. Images by GracedByTheLight/Thinkstock and Mats Lindberg/Thinkstock. I actually just made up that expression (you can probably tell because it’s terrible! ), but you get the gist. If you’re looking to get attention for your story about wildlife, you better either have charismatic megafauna or a whole bunch of dead bodies. And if you’re going the dead-bodies route, let’s hope they died all at once because slow, incremental death is neither photogenic nor interesting. This week’s reminder of the truth of that statement is the story tearing up the internet about a heap of more than 300 reindeer killed by lightning in Norway. “[W]e have never seen anything like this,” Norwegian Environment Agency officials are quoted as saying, as if the work of an official in the Norwegian Environment Agency is otherwise full of thrills and adventure. Well, where are you supposed to go if you’re a wild animal? Just because we humans don’t see the results of these events that frequently (and then send in the aerial videographer) doesn’t mean they don’t happen. Think about it—if this had happened just 30 years ago, it probably wouldn’t have made international news. In fact, plenty of similar occurrences have happened in the more recent past: Marshall Shephard, writing for Forbes, found a host of examples of wild (and domestic) animals being killed by lightning. More than 600 sheep were killed in Utah in 2014, seal pups in Australia the same year, geese, African elephants, and many more. Giraffes seem to be a frequent target; the long necks that once gave them a Darwinian advantage over other leaf-eating ungulates now acting as a sort of grotesque biological lightning rod. Animals tend to gather together during events like thunderstorms, and if they’re standing in water, like these deer were, they’re more susceptible to a mass electrocution. Lightning strikes also kill humans, I should add, as many as 24,000 per year, though I bet none of them showed up on your Facebook feed. But 300 reindeer died at once, which is a large but still tangible number, so I bet it did show up on your feed. As of this writing, the story on the New York Times Facebook page has been shared 7,812 times in less than three hours. Compare that to an environmental story that actually matters, such as President Obama’s massive expansion of the Papahanaumokuakea Marine National Monument in Hawaii last Friday, home to more than 7,000 marine and terrestrial species, many of them endangered: That one was shared from the New York Times Facebook page just 1,062 times in four days. You won’t learn much about reindeer in these stories (did you know that reindeer and caribou are the same species, Rangifer tarandus?) because these stories aren’t about wildlife; they’re about gawking at the spectacle of death. 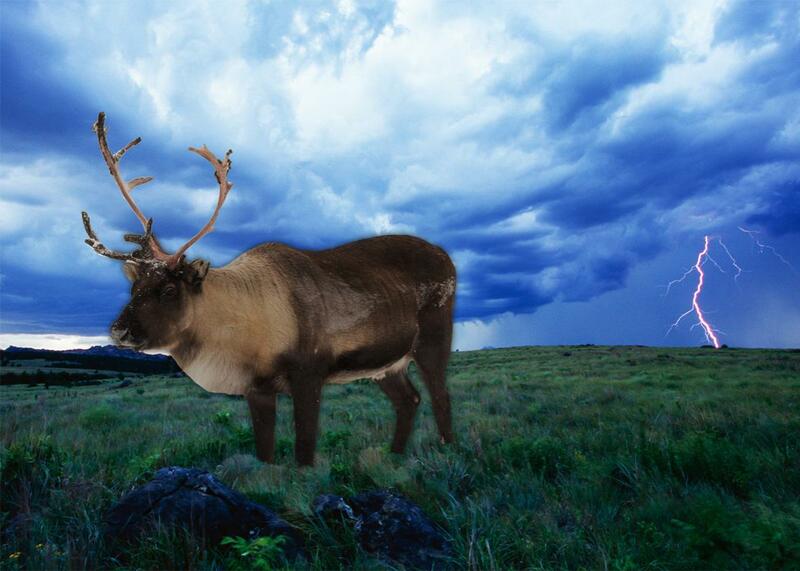 Reindeer populations are not at all threatened by the menace of lightning. They are threatened, of course, by climate change, though you won’t hear about that in the lightning stories. One of the major problems with reporting on climate change is that it’s operating on a much slower time frame than the news cycle, so it’s really hard to get people to care as much as they do about the 323 reindeer they can see all at once. The trickle of animal death resulting from climate change isn’t as flashy. The consequences don’t quite lend themselves to aerial video (yet). Actually, strike that—one of the potential consequences of global warming is more lightning. Researchers think that we’ll have three strikes by 2100 for every two we experienced in 2000. If only there were a good way to tell if the specific lightning bolt that killed these reindeer was due to climate change. There’s not, really. But we should try to figure that out—maybe that would be one way to get more people to care about climate change.